When you’re recovering from an injury or managing a condition, you want to take it slow. Getting back to your regular activities is the number one goal, but you need the right support to gradually regain your strength and function. Otherwise, you could end up with a re-injury. For new or old injuries, you can get extra support with bracing. Here’s everything you need to know about using a brace to help with rehabilitation. Bracing is a therapy option that uses external braces on various limbs to provide additional support for unstable joints or ligaments. Braces are often made of soft, durable fabric, but can also include metal, plastic and Velcro straps. They can be custom-made or come patient-ready. Your physiotherapist can make sure you choose the right brace and get it customized for your needs. Braces are often used when you’ve sustained an injury, before or after surgery, or have deterioration in your joints or ligaments due to repeated use, age or a chronic condition. 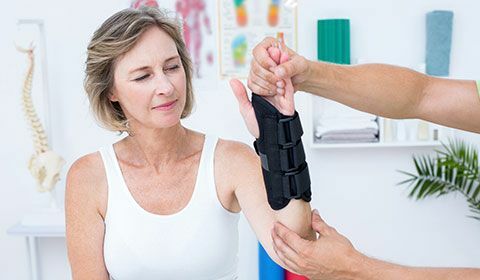 Following an accurate diagnosis of your injury or condition, your doctor, physiotherapist or other healthcare professional may suggest a brace to help with rehabilitation. Braces provide stability when ligaments, muscles and/or bones are still healing. This lets you (slowly) resume certain activities, gradually building up your strength and function while protecting you from re-injury. A brace is often used in combination with other types of therapy, such as physiotherapy, massage and more. The healthcare professional you’re working with will not only select and fit you for the right brace, but they’ll also provide instructions on when and how long you should wear the brace so you can get all the benefits. Bracing is a treatment that can increase joint stability, improve alignment and reduce excessive movements (such as bending, twist or side-to-side and front-to-back actions) that can aggravate the injury, cause pain and prevent proper healing. Braces help off-load pressure, absorbing some of the force encountered from a return to activity. They allow you to get back to your active lifestyle quickly and safely, whether that means your favourite sport or simple day-to-day activities like walking. There are three main types of braces, categorized by their purpose: prophylactic, rehabilitative and functional braces. Prophylactic braces are used to prevent injuries from occurring. If you have a high-risk of re-injury, this type of brace can reduce your chances of getting hurt. Rehabilitative braces are used after you’ve sustained an injury or undergone surgery to provide support, immobilization and compression (to reduce swelling). They restrict movement to protect the injured area while you start a return to activity. This type of external support is temporary, used to allow for proper healing. Functional braces are used after an injury to offset weakened or degenerated structures, protecting you from further injury during recovery. 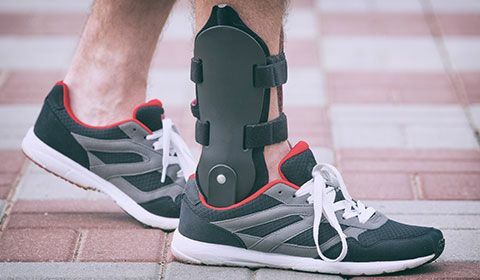 This brace allows you to return to sports or activities that place stress on the injured joint or ligament, giving you increased stability and body awareness as you move. Knee braces are one of the most common braces used, for both sport and everyday activity. Braces support the ligaments in the knee by controlling the amount and type of movements you can do. 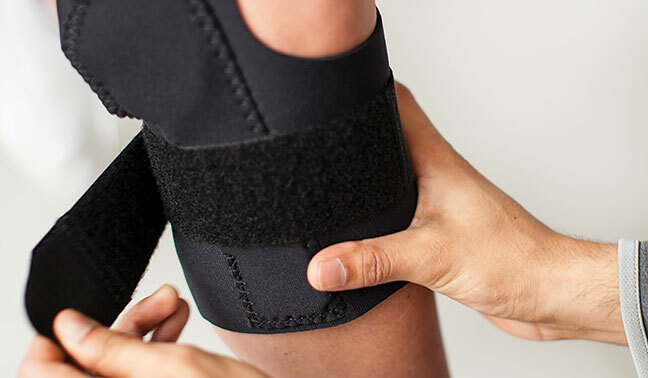 A neoprene sleeve is the most basic knee brace, which provides compression to reduce pain and inflammation. A patellofemoral brace helps the patellofemoral joint, a common area of injury. The brace places a doughnut-shaped hole with a raised ridge around the kneecap, pushing it outward when the knee is moving and allowing it to track properly, with no rubbing. A hinge brace protects against excessive motion right or left, protecting the ligaments on both sides of the knee. The rigid bars of the brace act as stabilizers and some have locking mechanisms to prevent you from extreme positions when bending or straightening the knee. An ACL brace prevents excessive knee rotation and forward translation of the tibia (shinbone). Athletes often use this type of brace following surgery. A knee immobilizer is used after ligament injury and surgery. It extends from the upper thigh to the calf, with plates behind the knee and on each side. Bracing for scoliosis is used to prevent moderate spinal curves from getting worse. It is not a corrective measure. It is often used for children with scoliosis to maintain alignment as they continue to grow. Once the skeleton stops growing, the bracing treatment is also stopped. If the child stops using the brace too early, the curve usually returns. What will a brace cost me? The cost of a brace can vary, depending on the type and level of customization. Some braces, like the neoprene sleeve, are patient-ready and can be relatively inexpensive. Others, like a knee immobilizer, have to be custom-designed to meet your measurements, which makes it more expensive. Many health insurance providers cover bracing equipment ordered through your physiotherapist or other healthcare professional. It’s always a good idea to inquire with your provider before getting fitted. Your therapist will provide instructions on when to wear your brace and for how long. They generally discourage 24-hour use.